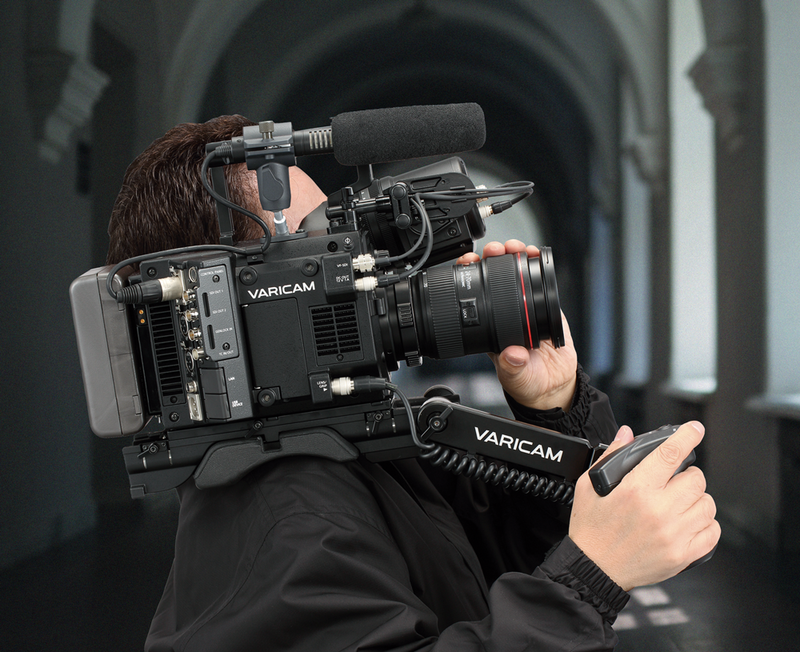 Compact Size, Light Weight and Top Cinema Quality — The VariCam LT! 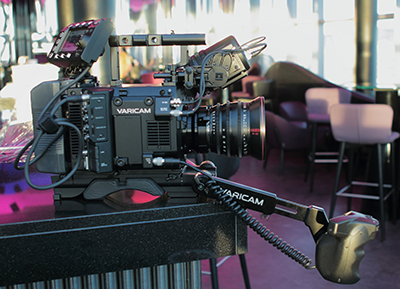 The VariCam LT has a compact and lightweight magnesium body and offers same picture quality specifications as the larger VariCam 35 cinema camera. 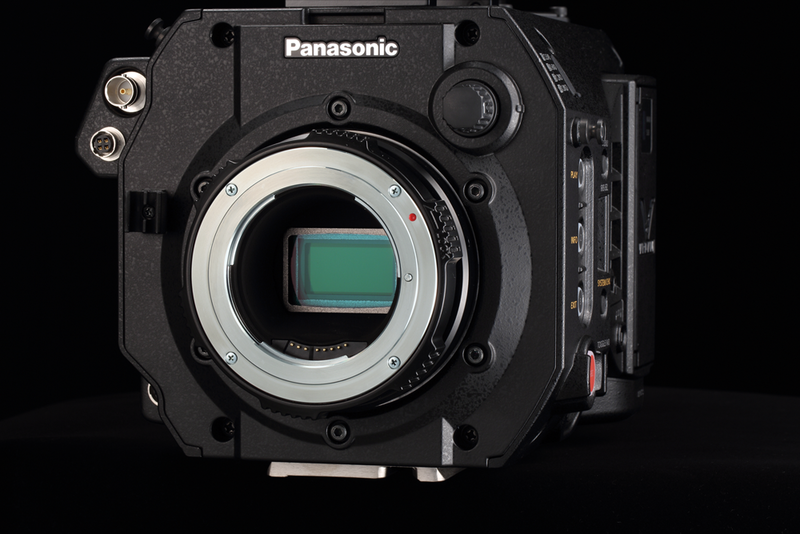 The super 35mm image sensor, which is the same imager as VariCam 35, features wide dynamic range, an expansive color gamut, and high sensitivity for 4K image acquisition. It has dual native ISO settings of 800 and 5000. The native 5000 ISO allows for clean shooting in very low light situations. 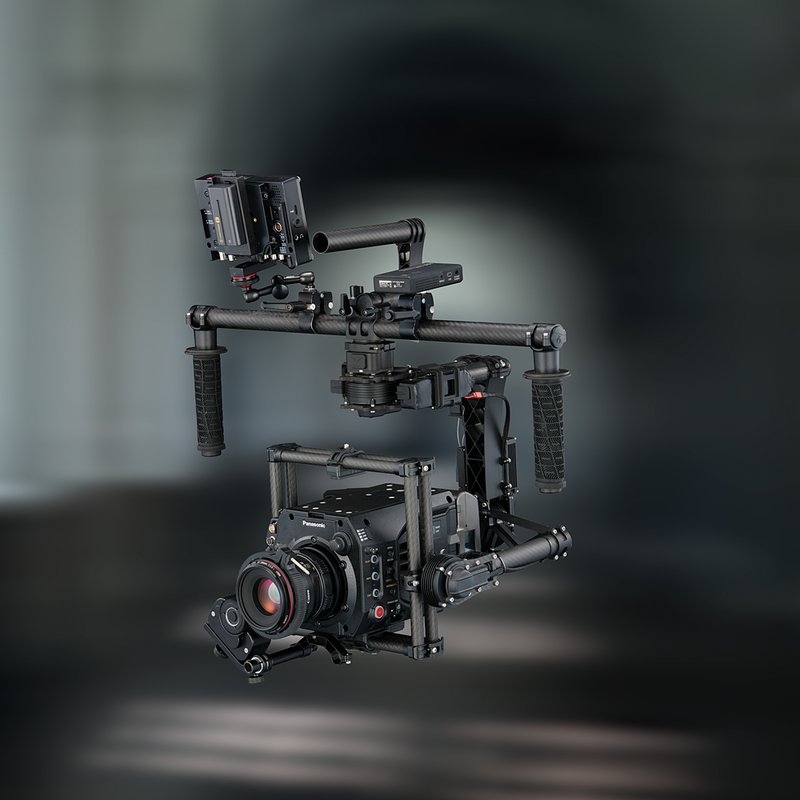 Its size and design facilitate a wide array of shooting styles including comfortable ergonomic shoulder mounted operation or use on gimbals and drones. One new feature that has been added to the VariCam LT is the EF lens*1 mount which offers a wide array of lens choices. The EF mount*1 can be removed by an end user and replaced with a PL mount (optional). 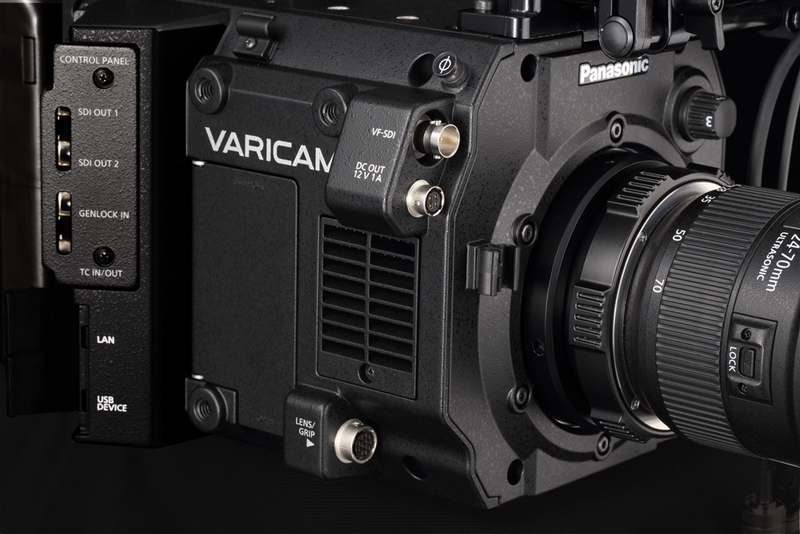 This allows for even greater versatility in lens selection when shooting with the VariCam LT. The VariCam LT workflow is very similar to that of the VariCam 35. Both cameras have a dual codec recording function that allows the user to record a primary or “main” codec as well as a smaller proxy file. In addition, each camera offers an in-camera color grading function and support for AVC-Intra 4K and Apple ProRes*2 codecs. Join the “REVOLUTION” and achieve your perfect “VISION”. *1: Panasonic does not guarantee the compatibility or performance of all EF lenses. For more details, to be updated on the Panasonic website. *2: ProRes is licensed from Apple Inc. Apple ProRes codec is from Atomos under license. 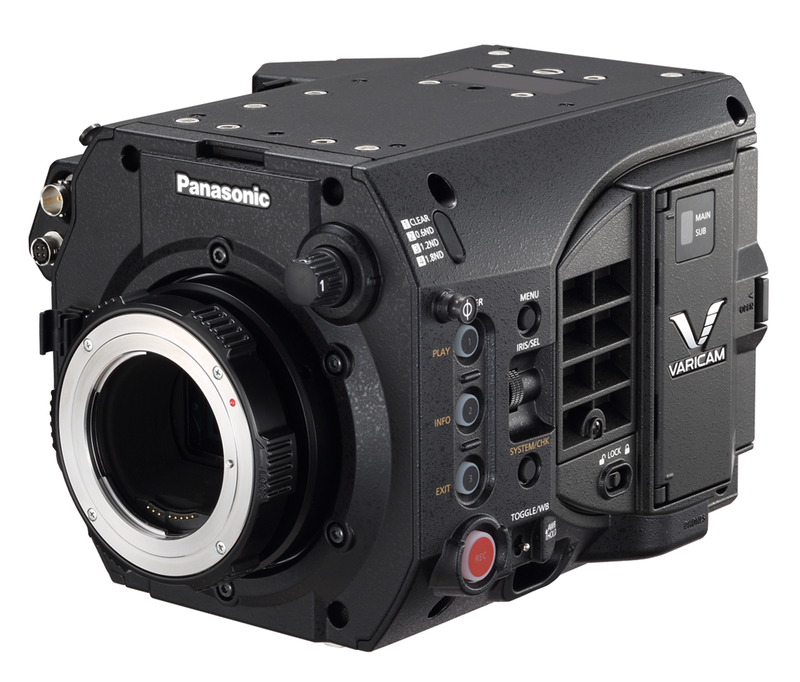 The VariCam LT is equipped with the super 35mm single-chip MOS sensor developed especially for the VariCam 35. It offers 4K (4096 x 2160) and UHD (3840 x 2160) resolution, and boasts high sensitivity, low noise, wide dynamic range and cinematic depth of field. This sensor received The Hollywood Post Alliance Engineering Excellence Award 2015. The VariCam LT has two native ISO settings: 800 and 5000. This means the VariCam LT achieves very high sensitivity while maintaining a low noise level at 5000 ISO. The noise level at 5000 ISO is nearly identical to that seen at 800 ISO. In order to achieve this function two dedicated analog circuits are implemented on every pixel of the imager of the the VariCam LT for each native ISO before gain processing. This allows the camera to achieve much higher sensitivity without increased noise. Normally noise is introduced in the gain process of rating ISO in digital cameras. This functionality is revolutionary for low light scene shooting. Especially this ISO 5000 enable to capture under the natural light keeping the mood making more realistic. 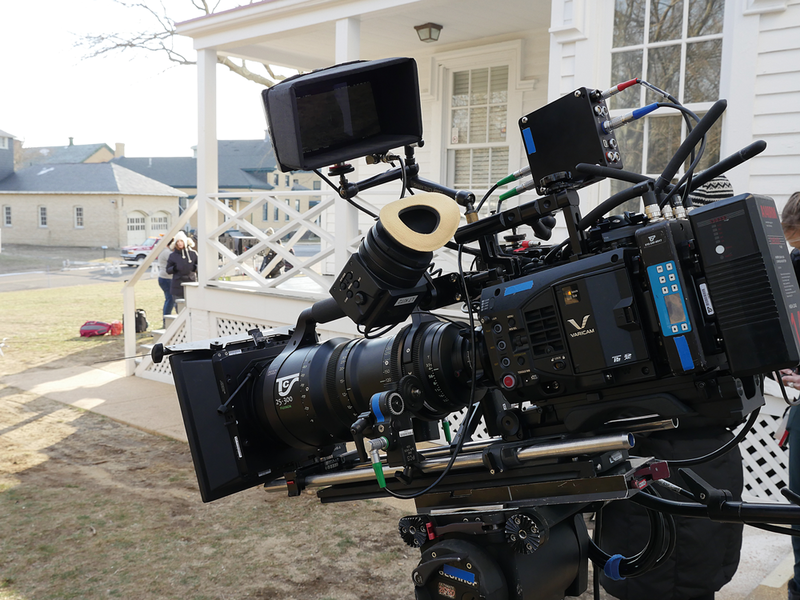 The VariCam LT is equipped with "V-Gamut," giving it a wider color gamut than that of film. V-Gamut also encompasses the entire BT. 2020 color space. The "V-Log" gamma curve offers 14+ stops of dynamic range and facilitates advanced color grading adjustments in post production. The five position scene file function is new to the VariCam LT. The VariCam-LOOK (V-LOOK) mode is a newly developed setting for creating cinematic images without color grading. A newly designed gamma curve that allows detail to be maintained over a greater tonal range within the Rec 709 color space has also been included in the VariCam LT. The "V-709" gamma setting provides a tone suitable for viewing on standard monitors while the "BC-LOOK" creates a look that mimics traditional TV broadcast images. 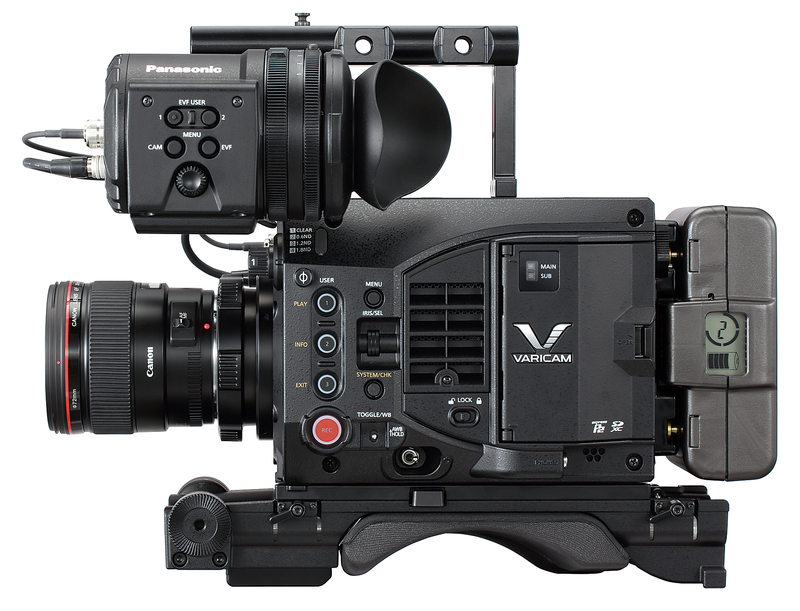 The VariCam LT provides down conversion to Full HD via two 3G HD SDI outputs and one VF output (BNC) while shooting in 4K. 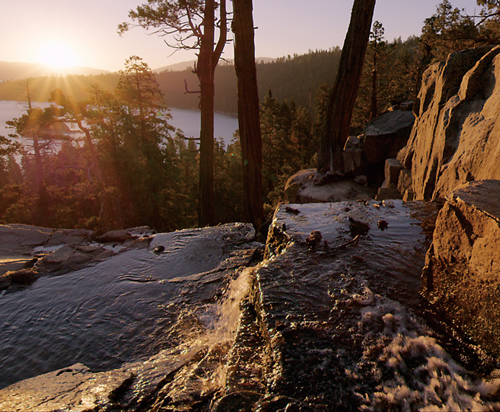 Your look with in-camera color grading and information overlay can be applied to each output. The maximum frame rate when recording in 4K (4096 x 2160) or UHD (3840x2160) resolution is 60p (60fps). This produces smooth, high-resolution images when recording fast-moving action scenes. When shooting in 2K (2048 x 1080) and HD (1920x1080) resolution, high-speed 240 fps recording can be used to produce an extreme slow-motion effect. This is achieved by cropping the image sensor recording area in order to achieve a faster scanning speed. 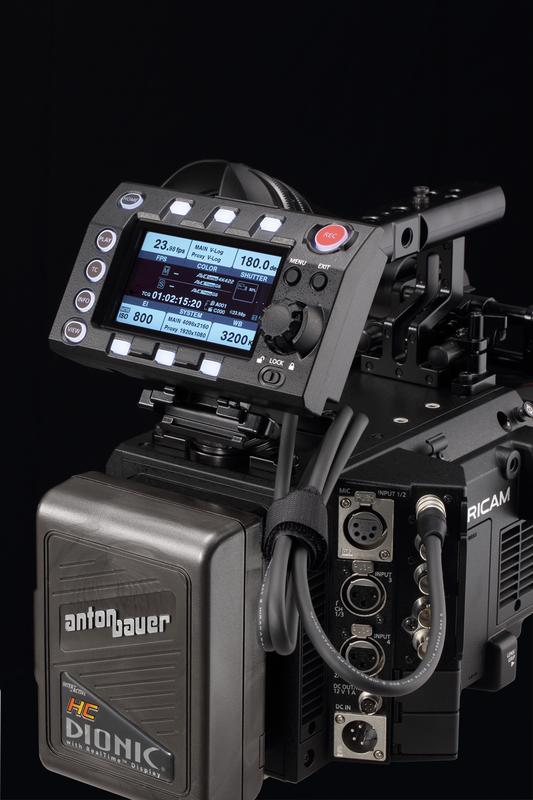 Variable frame rates are available from 1 to 120 fps in AVC-Intra 2K422 and from 120 to 240 fps in AVC-Intra 2K-LT. The frame rate can be changed while recording. 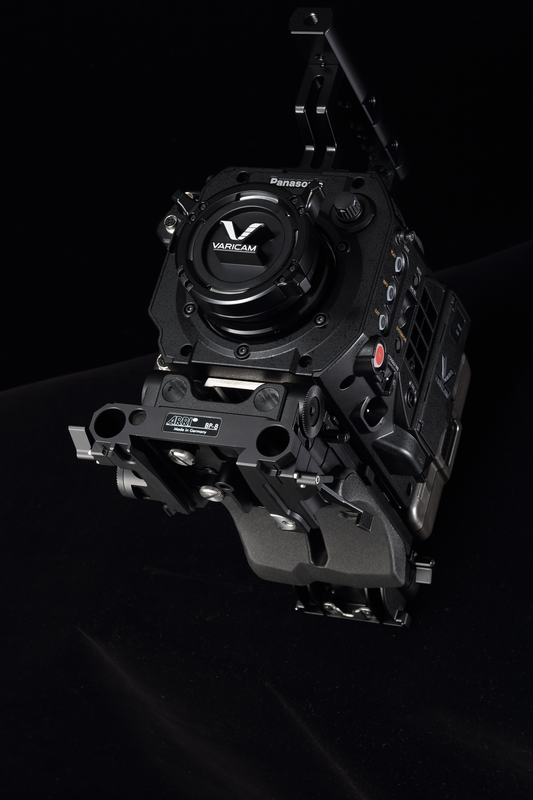 The Cinema VariCam LT has an integrated, detachable IR cut filter. User can do the IR shooting to record 4K images in dark unlit nightscapes. This is ideal for capturing nocturnal wildlife and other scenes with no illumination. Also, the IR filter can be used in daylight as a creative tool for achieving a unique look. The supplied control panel has a built-in 3.5 type LCD display panel. It can be used for menu operation or as a live/preview monitor. The keys and dials are laid out around the display for quick and accurate operation. Frequently used settings can be accessed directly. The detachable structure allows the camera to be operated from a distance of up to 90 cm. 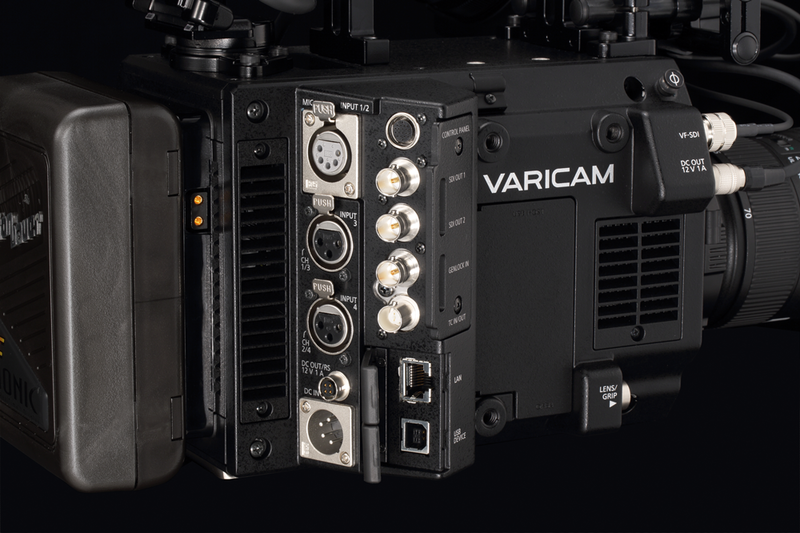 The VariCam LT has a regular BNC connector for the View Finder. Users can select from various HD monitors or viewfinders in addition to the new Panasonic View Finder (AU-VCVF10G). The DC power and command control connectors for the Panasonic VF are also provided. The lens mount is made of stainless steel, and designed to prevent flange back deviation due to temperature changes. The camera body is made of strong rigid magnesium. The top and bottom panels have been made flat for easy installation of various plates and accessories. Mounting holes are provided on both sides as well as on the handle for convenient mounting of accessories. 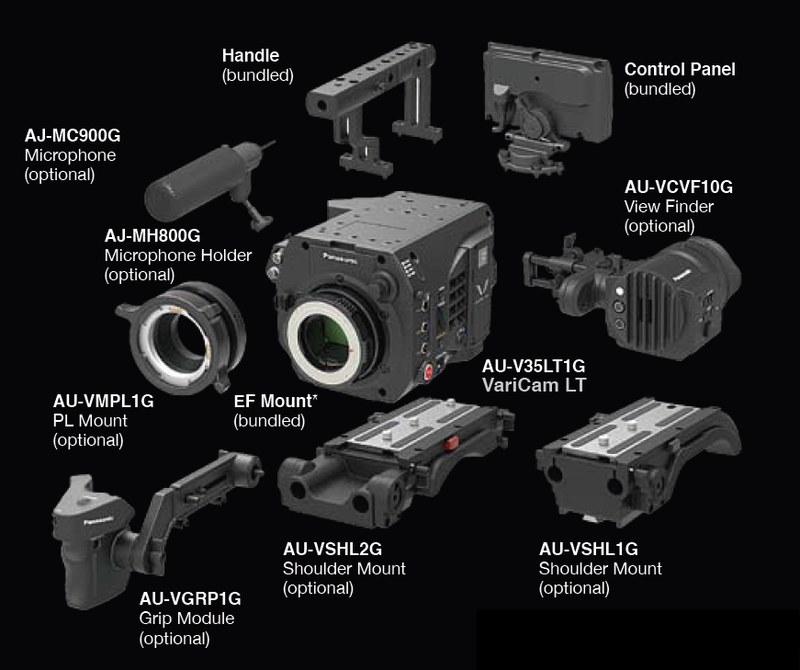 New accessories include the new Shoulder Mount (AU-VSHL2G) and Grip Module (AU-VGRP1G). The new Shoulder Mount (AU-VSHL2G) installs directly on a base plate. AVC-Intra 4K is a 4K-compatible version of the AVC-Intra, intra-frame compression codec that is suitable for cinema production. 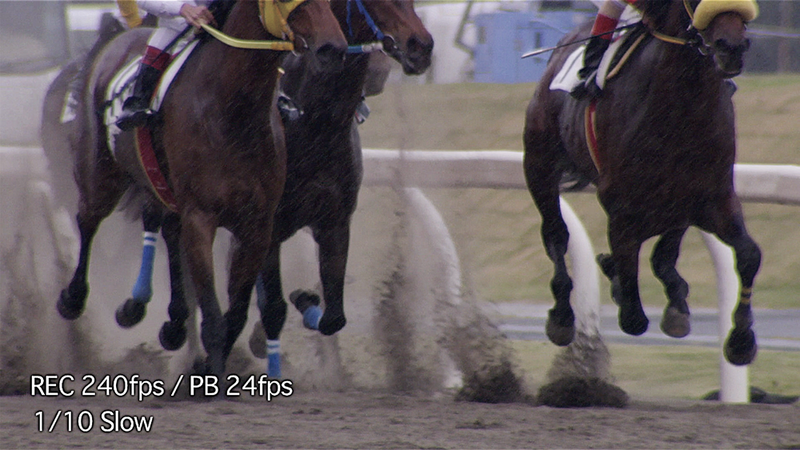 Using this codec, the VariCam LT can record 4K (4096 x 2160) or UHD (3840 x 2160) resolution. 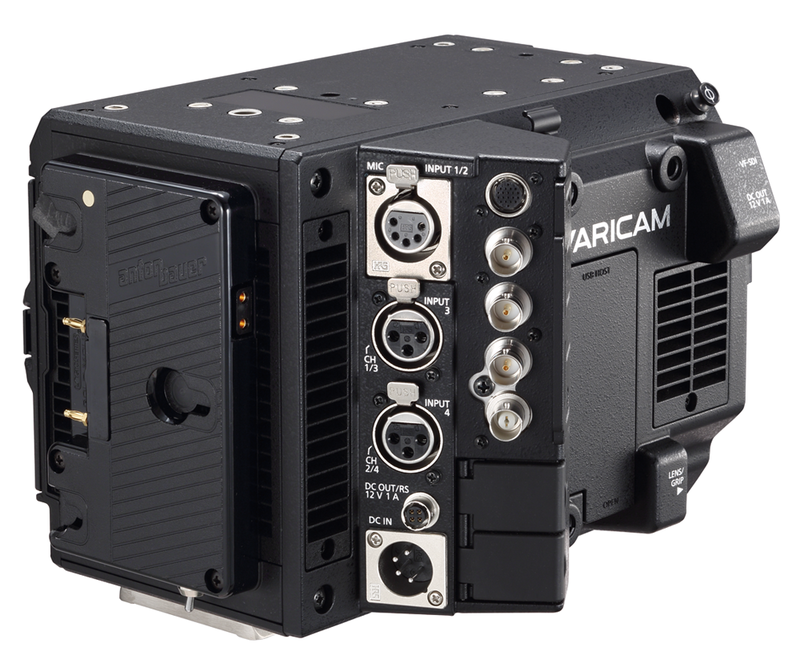 For 2K recording, the VariCam LT supports AVC-Intra 2K444/2K422/2K-LT. For HD recording, the VariCam LT supports AVC-Intra 444/422/100/LT and Apple ProRes 4444/HQ. Using the 256 GByte expressP2 card, the camera can record approximately 90 minutes of 23.98p 4K video with AVC-Intra 4K422. * ProRes is licensed from Apple Inc. Apple ProRes codec from Atomos under license. Atomos is trademark and copyright of Atomos Global Pty. Ltd. 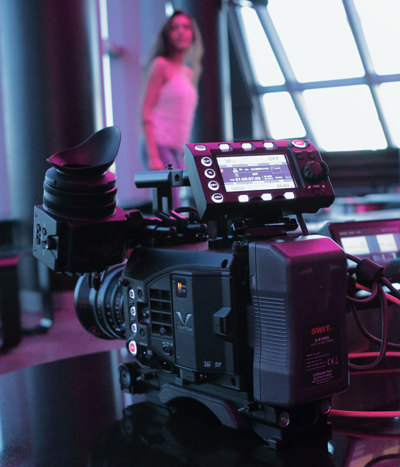 The VariCam LT features an in-camera color grading function (3D LUT/CDL). 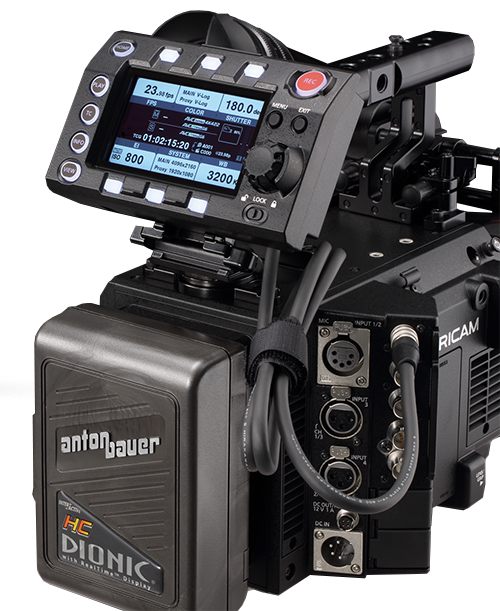 This enables color tuning on set as well as in the field when using the camera control panel or 3rd party software. 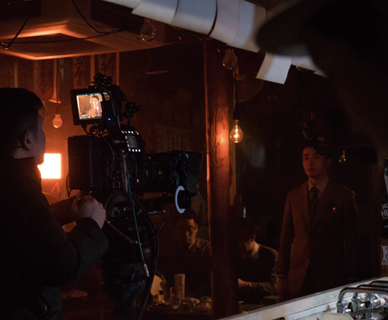 This means dailies which had been created after shooting can now be produced on set with the camera. Grading information such as 3D LUT files and CDL files can be recorded together with the image data, allowing you to provide the same vision that you created on set to the editorial staff.